Because the BlackBerry can hold so much important information, you want to protect it from prying eyes. Security apps can help you keep your confidential info under wraps, even if your phone is lost or stolen. 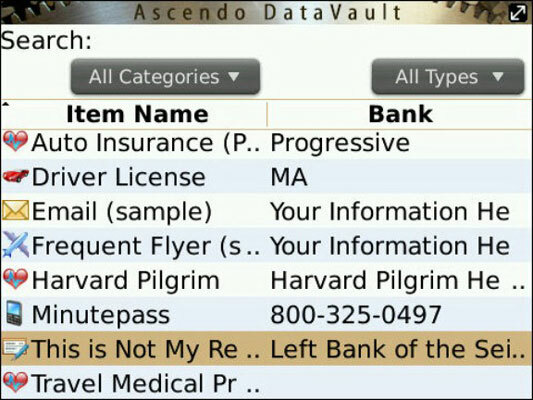 Ascendo DataVault is a password-protected vault that sits on your BlackBerry and holds any information you choose to put within the vault. The standard set of categories includes credit cards, bank accounts, insurance information, logins and passwords, and descriptions and serial numbers for your possessions. But this is a free-form database; it can be adapted easily if you want to use it to store any other sort of data that’s important to you. The key to the vault is the use of the Advanced Encryption Standard (AES), one of the strongest encryption systems available to ordinary folks. Your responsibility as a user is to create (and remember) a password that is complex enough to prevent anyone from guessing it. Terra Mobility’s BuddyGuard is an electronic bodyguard of sorts, allowing you to use the power of the Internet to take back some control over a lost or stolen BlackBerry. 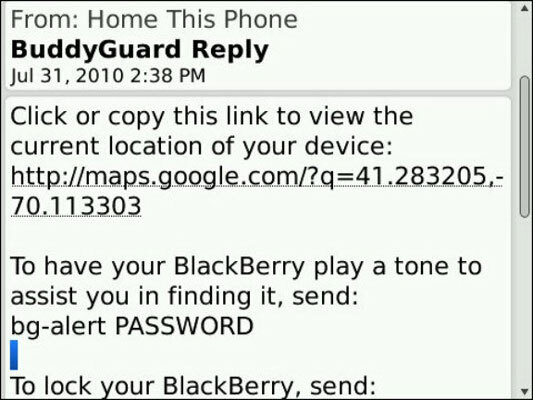 BuddyGuard works by scanning any e-mail or SMS text message sent to your BlackBerry from another phone or from a computer. Each command you input from a location other than your BlackBerry must be followed by the complex password you put in place when you install the app. Here’s another take on the shut-it-down, wipe-it-out, and try-to-retrieve-it app. BAK2u Mobile Security’s PhoneBAK acts as your agent to report on the approximate location of your phone, alert you if someone inserts an unauthorized SIM card into your BlackBerry, provide details about that usage, and display a warning on your phone declaring that bad things happen to bad people (or whatever else you’d like to say).